- PaisaPay is eBay's online payment service, where buyers can pay sellers through credit card or Online Bank Transfer. Buyers should use PaisaPay for fast, assured purchases or your money back! Buyers pay eBay using credit card or online bank transfer. PaisaPay confirms the payment and advises seller to ship. Seller enters shipping details on the My PaisaPay section in My eBay and ships the item. Important: This is an important step – the buyer is eligible for a refund if the seller does not enter shipping details within the timelines. Buyer receives the item and confirms the delivery. Note: The buyer can also claim a refund if the item is not delivered. 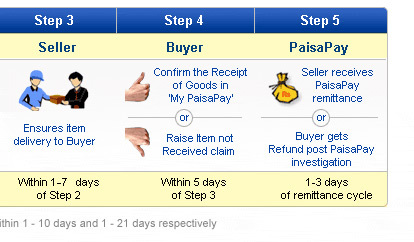 The buyer must complete this action within timelines to be eligible for a refund through PaisaPay. After the timeline is over, the buyer can claim a refund through the eBay Buyer Protection Program. After the buyer confirms item was delivered (or does not respond within timelines), the seller's Paisapay account is credited with the payment. The money is then remitted to the sellers bank account in the next Payment cycle. Note: Qualified sellers will receive their payments as soon as they input shipping details in the PaisaPay system. eBay periodically transfers the payments online to the seller's registered bank account. Offer this fast and easy payment method to your buyers and receive online payments. Eliminate the delay related with other payment options like cheques, demand drafts, etc. No fees - absolutely free for buyers! Pay instantly using your credit card or make an online bank transfer and receive the product faster, thus eliminating the hassle and delays of cheques and demand drafts. Make fast, assured purchases, and get your money back if the seller does not deliver the item. You can also claim up to Rs. 50,000 under the eBay Buyer Protection if the item delivered is not as described. Get discounts with eBay Gift Vouchers: If you have received an eBay Gift Voucher , you can redeem your vouchers to get great discounts while paying through PaisaPay. How to pay using PaisaPay? - If you have any questions about the item, click on the Ask Seller a question link and clarify your doubts. Once you make the payment you will receive a confirmation through email. You can check the status of the PaisaPay transaction in your My PaisaPay. You will also see the payment confirmation in your My eBay as a yellow bar below the transaction. Registration with PaisaPay is absolutely FREE. All you need to have is a valid bank account in any of the PaisaPay supported banks. Once you are registered with Paisapay, the Paisapay logo automatically appears as a payment method in all your listings. PaisaPay is a mandatory payment method and will appear automatically in all your listings. Easier and convenient PaisaPay remittances: Earlier PaisaPay would send you a demand draft for the amount in your PaisaPay account every 7 days. With the new PaisaPay, your payments will be transferred to your PaisaPay account online as soon as the buyer confirms receipt of the item. Online Remittance: Twice a week, PaisaPay will transfer your remittance online to your bank account. So no more hassles of depositing demand drafts and waiting for clearance. Your bank account will instantly receive your money. Transaction Details Page: Tracking all the items bought by one buyer is now made simple. You have a comprehensive information page for each PaisaPay transaction. This includes order details, shipping information, action points, refunds, and current transaction status. How to receive payments through PaisaPay? How does a PaisaPay transaction work? Step 1: Buyer pays for the item using PaisaPay (credit card or online bank transfer). PaisaPay confirms the payment and advises you to ship the item. 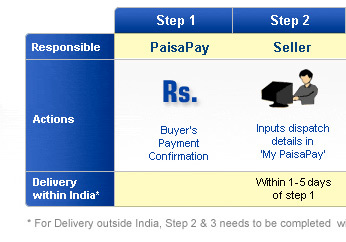 Step 2: You ship the item and provide shipping details (courier name and airway bill number) in your My PaisaPay. Note: If you do not enter shipping details within the specified timelines, your payment will be refunded to the buyer. Step 3: Buyer receives the item and confirms to PaisaPay that the item was delivered. Step 4: PaisaPay transfers the payment to your PaisaPay account, which is sent periodically online to your registered bank account. * Qualified Sellers will receive the remittance as soon as the seller inputs the shipping details in the PaisaPay system. Note: For Cash on Delivery payments through PaisaPay, permitted Seller shall be required to print label and mark ready to ship in the PaisaPay Facility as a mandatory step before the item is handed over to the Logistics partner for delivery. If the seller does not print the shipping documents from My PaisaPay, eBay may cancel the buyer’s transaction. What are the important action points to remember? As part of the new PaisaPay transaction flow, you will now need to keep in mind certain milestones and action points to ensure that your transaction goes smoothly. Enter the shipping details: After the buyer has paid for an item, be sure to provide details of shipping within the timelines. If you miss this deadline, PaisaPay will treat this transaction as unsuccessful and refund the buyer’s payment. Meeting delivery deadlines: After providing shipping details, a delivery deadline will be available on the Transaction Details page. You must ensure that the item is delivered to the buyer before this deadline. If the item is delivered within this timeline, the buyer’s payment is transferred to your PaisaPay account, which will be remitted to you after the buyer confirms receipt of the item. If the item does not reach the buyer within this deadline and the buyer informs PaisaPay, PaisaPay will investigate the case and refund the buyers payment. Request for shipping / delivery time extension: If there’s a possibility that you may not be able to ship / deliver the item within the specified shipping deadline, you can request the buyer for a time extension. Be sure to request for a time extension before the deadline to enter shipping details. Provide proof of delivery to PaisaPay: When the delivery deadline is over, PaisaPay will request the buyer to confirm whether the item was delivered or not. If the buyer confirms that an item was not delivered, PaisaPay will initiate a refund. However, if you have shipped the item and the buyer has accepted the delivery, you should contact PaisaPay immediately. PaisaPay will investigate the case and accordingly refund the buyers payment or remit the amount to the seller. What are the important timelines to remember? To receive online payments, PaisaPay charges a processing fee (excluding applicable taxes). To see the PaisaPay fees, click here.